The ban on smoking in public deliberately included actors on set when it was introduced in 2007 to protect their health, newly released Welsh government documents show. But ministers now want to relax the ban and allow actors to smoke in front of TV and film cameras, as in England. They hope it will help the economy by attracting filmmakers to Wales. However, some AMs and health campaigners are opposed, and say it will send out the wrong message. The law against smoking in enclosed public places in England has an exemption for theatrical performances and film sets. Exposure to second-hand smoke was harmful in 2006 and is still harmful in 2012... is the economic case for allowing this exemption more important than public health? Documents obtained by Plaid Cymru through a freedom of information request show why ministers in Wales decided not to adopt the same policy. A Welsh government briefing paper from 2006 says: "Those working on theatre and film sets require the same level of protection as other workers. "An exemption for performers would undermine the health message about the harm from exposure to second-hand smoke, and would appear unfair to the wider public in Wales." The health minister at that time, Brian Gibbons, said: "The health rationale for smoke-free provision applies in all enclosed settings." Another document says theatre audiences needed to be protected from second-hand smoke. But the government has since changed its mind and now says there is an economic case in favour of an exemption in Wales. Film makers have lobbied the Welsh government to make the change. The BBC is also in favour of an exemption. A vote was due to be held in the Senedd on changing the regulations, but it was put on hold following concern from some AMs. Without an overall majority, the Labour Welsh government cannot rely on its own members alone to win votes in the chamber. Ministers have invited committees of AMs to hear arguments from both sides and to produce a report. 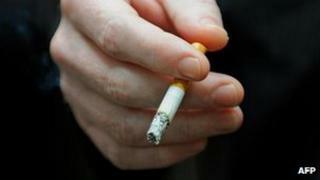 Plaid health spokeswoman Elin Jones said: "Exposure to second-hand smoke was harmful in 2006 and is still harmful in 2012. "Any relaxation of the current regulations would send the wrong health message to the public and there are alternatives to cigarettes available. "Is the economic case for allowing this exemption more important than public health?" A Welsh government spokesperson said ministers remains committed to reducing smoking rates in Wales and to protecting non-smokers from the dangers of second-hand smoke. The spokesperson said: "Creative industries are one of the key growth sectors within the Welsh economy and so it is important when trying to attract further investments that production companies filming in Wales are not placed at a disadvantage to those in England, where a similar exemption already exists. "Certain conditions will apply to the exemption in Wales which mean performers will not be able to smoke during rehearsals or when an audience or children are present. "The Welsh government reiterates its support in principle for the exemption going ahead on economic grounds but recognises there is concern about its impact on public health. "The Health and Social Care and Business and Enterprise Committees will therefore be taking evidence on this issue before publishing a joint report."